The power of the process can never be underestimated. Something enters into a process, undergoes a truly transformational experience and emerges very different. Unfortunately, the process is almost always misconstrued by those who would be so quick to judge without ever seeing the process to its completion. The caterpillar, for example, after entering into its cocoon, may feel isolated, constricted, suffocated. But once the process is complete, it emerges as a beautiful butterfly. Today though, I’m not here to talk about the transformation of caterpillars. I am here to talk about a much more metamorphic process: spending six years in the Den. Very Reverend Father Chukwuyenum Afiawari S.J., the Chairman, LJC Board of Trustees (Provincial Superior of the North-West Africa Province of the Society of Jesus). His Excellency Archbishop Antonio Guido Filipazzi, Apostolic Nuncio to Nigeria. Sister Philomena Aidoo S.H.C.J., the Provincial of the Sisters of the Holy Child Jesus and a member of the Board of Governors of the College. Members of the Board of Trustees of the college. Members of the Board of Governor. The commencement Speaker, Dr. Bolanle Oyeledun. The President of the college. The Principal of the college. Other Members of the Management Staff of the college. Members of the Board of Trustees of LJC Endowment Fund. Members of the staff of Loyola Jesuit College (the Noble Colleagues). Parents of the Graduating Class. Other Parents of the Pride present. Special Friends of the college. The Pride of Loyola and the Class of 2018. 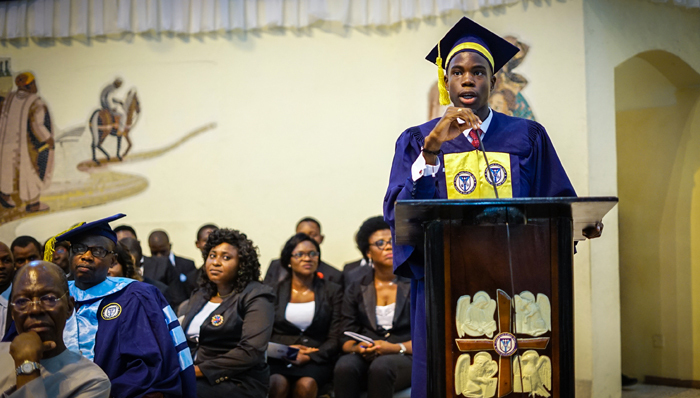 I am deeply honoured to stand before you today as the valedictorian of the LJC Class of 2018. Let’s talk about rainy days…we all have them. We all know what they feel like. Sad, gloomy, depressing, and seemingly endless. Now, I’m not just talking about water falling from the sky. I’m talking about anything that comes to block out your sunshine: You got a demerit (rainy day), you just failed an important test (rainy day), you just got a suspension for a little thing, Oh! (rainy day). These kinds of rainy days, much like actual rain, fall everywhere and on everyone, the Den and the Pride included. So get out your umbrellas and don your rain coats, there are showers ahead. Let’s start from the beginning, since I heard that’s a very good place to start. On September 8th, 2012. A hundred and nine of us little lion cubs had just come into the Den after our long and tireless nights with our greatest companions: the legendary Ugo C. Ugo and Kaplan all in the name of passing the dreaded LJC entrance exam. By now, we had all realised that our parents had several secret meetings to “pursue” us from home. And now in the Den, we had to do our own laundry and grooming. We no longer had unlimited hot water. And we had to be very much independent. We had gone from pancakes to pounded yam, French fries to fish roll, and, of course, from apple pie to akara and pap. We learnt that trying to pass between seniors was pretty unwise. We learnt that it was possible for three people to share a single slice of bread. We learnt that laughing at a senior’s joke when he wasn’t talking to you meant trouble. We learnt that wake up calls could not only be heard but felt. Uzo began setting records on the tracks. Daniella’s dance reputation was now very well established. Ayomide began blowing us away with harmonies. And our very own Ernesto-the-besto and Michael Ofomata became amazing soccer players, except not on the right field. They had become Pele and Maradona, and every Saturday, they would run back to the dorms, undress to their polka-dot boxers and bring out their tennis balls for dorm soccer kick-off which was usually at quarter past eleven. ***Parents please take note: if your son asks you for a tennis ball, without mentioning a tennis racket, be extremely sceptical and ask very many questions. Nevertheless, we were comforted by the fact that it was all a phase and that after a few years, we would be SS3s. We would have minions of our own to send. We would be sitting at the front during movies, and we would enjoy all the other perquisites of being in SS3. We knew that in just a few years, we would be kings and queens of the college. Or so we thought. When we had finally got to SS3, the wings that we were longing to spread were now snipped and our dreams were shattered by a strange phenomenon… the Help Protocol. Now what exactly was the protocol? Well, Fr. Joe-Stanis had initiated a system whereby a student could only be assisted by his classmates or seniors. So, you can imagine, an SS3 is severely injured after some horrible accident. A junior, but a very large, muscular junior is passing. The SS3 asks the junior, “Could you please carry me to the clinic? I’m in serious pain.” And meanwhile, the junior replies “Jeez, man. That looks bad. I would help you. But y’know…the help protocol and all. To most of us, it seemed absolutely bonkers. I mean, who would ever put a limit to the number of people who were allowed to help someone? The answer to that question is not something I’m entirely sure of, but the rule does remind me of something: “The greatest of you must become the least.” And so even though it boils down to a lion taking orders from a mouse, we decided to boldly embrace this newfound “servant royalty.” After all, it was not as if we had a choice. Come to think of it, you can’t mention rainy days in LJC without mentioning the man that seemed to bring with him an entire rainy season. I believe that after all that he has done, he at least deserves an introduction. It was the beginning of our much awaited JS3 year. We were finally the lords of the junior block, the top of the bottom half of the food chain. We received a glimmer of hope in the form of a very important announcement: We were getting a brand new principal. We expected that a ‘shelterer’ was coming. One who would ease the downpour and lift our every burden from our backs. But instead, Fr. Emmanuel introduced Fr. Joe-Stanis of the Society of Jesus as our new principal with the words: “Now there are two of us.” And we knew that meant trouble. With a new principal came…. well… new principles, new policies, new standards, new ideals. We knew all of this of course. We just wished his ideals could have been a little more… ideal. Instead of being a canopy to stop us from getting drenched, he brought even more rain upon us. There was the time he locked hundreds of us outside the dining hall till past midnight because we came late for nightcap. There were the numerous times he reminded us that our games time, our classes and even our food were privileges given to us by the school. In fact, there was the time he once threatened to erase an entire set. A feat even the amazing Tikky 20 eraser could never have accomplished. By now, you can imagine there being water all over the place. And somehow, he still managed to make this place heat up like an oven. And what’s more, he said through all this, he wanted us to have MAD FUN! But on a much more insightful note, he was brought in to form us and he did so expeditiously. It takes a lot of force to mould cool metal (let alone wet metal). He had to break down to rebuild, disassemble to reassemble and meltdown to recast. And as much as he knew, it would be hard for us as well as for him, but he courageously went ahead with it. Why? Because like any good father, he cared. He only punished us to have us learn some things the hard way and was never shy to remind us that we were outstanding. All he really wanted for us was to be the best. And remember how I said he made this place like an oven? Don’t worry; we ended up being cooked to perfection. And little did we know that all these times he was whipping us into shape, he did it also because he was preparing us to start handling some serious responsibilities. Not long after, we would assume positions as Hostel Prefects and Table Heads; positions we would soon embellish on our university applications as “Residential Dormitory Supervisors” and “Sectional Refectory Heads.” However, we were not quite there yet. Many of us were still behaving like juniors. Many of us still thought that we were going to be guided through anything and everything. Many of us still let teachers chase us around to submit our assignments. However, when our first few CEs and our CA came out, we were all compelled to sit up and brace ourselves for a serious storm. People began banging Bios. More were crushed by Chemistry and several tried to fathom Physics… and failed. We tried our best only to end up with wounded report cards and serious headaches. We were meeting teachers who would play and smile with you in class, but when you answered tetraoxosulphate (V) instead of tetraoxosulphate (VI), they would not spare you if you asked for half, quarter or even a tenth of the mark. Our eyes opened wide when we asked one another, “Yo guy, how were your Bios CEs?” And the other would reply, “Ah! My two scores don’t even add up to a hundred.” It seemed like at this time, the rainy days were becoming worse, especially for those who had not got a grasp of themselves and for those who still thought that LJC was merely a playground. The school found no better a time to whip us more into shape and teach us essential values. We were handed over to the much feared Man O’ War for further moulding. Overnight, LJC transformed from a secondary school to a military camp as we spent two very long weeks of our summer holiday tying knots, climbing ropes, going under barbed wires and hiking across Abuja under the careful supervision of Mr. Fatai and his cohorts. After climbing a mountain, starting a fire with sticks, cooking our dinner in the woods, and discovering the underside of the tables in the dining hall very many times all in the name of punishment, we emerged with many lessons learnt, skills acquired and stories to tell. In those two weeks, we had further developed to become leaders. So… of course, the school made us leaders. But it wasn’t that straightforward. As Uzo Evuleocha can attest, if you want to win something, you have to run for it. This hustle for prefectship posts began with our miraculous change in behaviour. Certain candidates dragged out from their boxes their baggiest and whitest uniforms which they had never worn since they were given. Long queues of aspiring prefects could be seen spilling into the barber shop every other day. Many more people had started greeting members of staff. And when a teacher would say to one of us, “Ah! You are changing O,” he or she would reply, “Haba ma. I’ve always been like this.” Some of us delivering our manifestoes had promised to change the notorious akara and pap to pancakes and syrup. Some others spoke like they would become the next Stalins, preaching severe punishments for deviant behaviour and miraculous cures for lateness in the Den. In all honesty, we were just playing plain politics, like every good Nigerian does. So when the college finally selected those they deemed fit to be prefects, things got tough for the chosen few. It was a challenge juggling academic work with these extra responsibilities. And this brought about one thing: serious hard work. But this hard work was nothing compared to what we experienced that summer: The Service Project. Imagine this: you go to an orphanage, hospice or autism centre in the middle of nowhere and spend the better part of a month cooking for young children, cleaning after them, having them kick you, pee on you and even pull your hair (if it was long enough, of course). We were pretty sure this was the worst way to burn away three whole weeks of our summer holiday, especially the only holiday we had to study for WAEC, get ready for SAT and apply to college. But to be truthful, we couldn’t have a more heretical view of the whole situation. Service Project was great. I mean, it was our chance to give back to a world that had been so kind to us. It was our chance to thank God by using the life he gave us to do good, to love those who had no one to love them, to aid those who were completely incapable of returning the favour. I’m not sure how many of us would be willing to do the Service Project all over again, but I do know it’s an experience that none of us will ever regret having, much less, forget. That is the thing about all these so-called “rainy days” we had in the den. No matter how sad, gloomy, or depressing they appeared to be, there was always a ray of sunlight through them all. The Help Protocol that we complained about taught us how to be self-reliant and to give more than we got. For every CE we failed and cried about, there were lessons to be learnt that we will never forget. Every punishment we received reminded us that we should think before we act. And about the Man O’ War… seriously, when else would we have learnt how to climb a mountain. That’s the thing about rain: even when the sun is there, the rain stops you from noticing it. Now, all of us have realised that all these times when we thought that things weren’t going so well or we felt the school was being way too hard on us, they were doing everything they did because they loved each and every one of us. They did everything for our own good. That’s what I said from the beginning about process: you rarely ever appreciate it until it’s over. We survived. The rainy days are over, the sun is out, and a beautiful, important rainbow has been formed. I call the rainbow important because it means something: a promise. A promise from God to keep showing us mercy. From us, it’s a promise to all of you to go out and set the world on fire because you have helped us grow and we are grateful. We thank you our awesome teachers. You have been a major contribution to our successful formation. Thank you for the times you showed us love and care. Thank you for the times you pushed us to the limit. Thank you for the times you would not spare the rod, or at least the red pen, in order not to spoil us. We will never forget you and you will always be in our hearts. We thank the administrators who worked tirelessly to ensure that our stay in the Den was fruitful. We know you only want the best for us. We thank the chaplaincy for boosting our spirituality and making us RELIGIOUS – a characteristic feature of a Jesuit grad at grad. We thank our parents who have been with us since before the beginning. We thank you for the houses you did not build, the cars you did not buy, the vacations you did not take, the land you gave up, the jewellery you sold, the parties you did not throw. We thank you for all the sacrifices you made in order to see us through these six years. You are truly wonderful and we honestly do not know where we would be without you. God has blessed us with you and we are truly grateful. We cannot thank you enough. We also thank our fellow students who we leave behind today. It is really easy to look at your current situation and dismiss it as misery and misfortune. But I’m here to tell you that you are in the best place possible. So brace up and embrace it. We did it and you can too. It doesn’t matter what kind of storms you may be passing through right now. Take it from me, there is a rainbow at the end of the storm and it is beautiful.